Check out the content and feature updates in the KnowBe4 platform for the month of March! 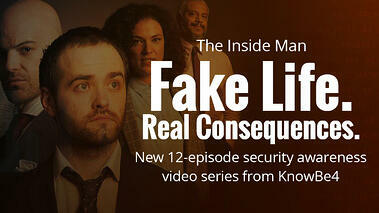 We’re excited to announce the release of an innovative new security awareness video series called ‘The Inside Man’ . In this new 12-episode video series, a compelling story, an incredible cast, and very high production values combine to create the coolest series ever streamed. Produced in partnership with our friends at Twist & Shout, The Inside Man is KnowBe4’s first custom network-quality video series that delivers an entertaining movie-like experience for your users and makes learning how to make smarter security decisions fun and engaging. From social engineering and passwords, to social media and travel, The Inside Man reveals how easy it can be for an outsider to penetrate your organization’s security controls and network. For more info on the episodes, read the blog post here. Check out the fresh new content and feature updates in the KnowBe4 platform for the month of March 2019!